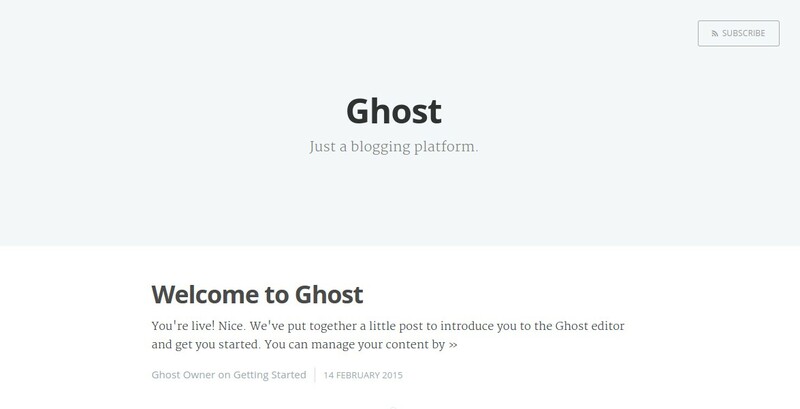 Ghost is an open-source blogging platform that runs on Node.js. It features a theming system , multi-user blogging capabilities and a markdown editor that lets you see a live preview of the content you are working on. In this post, I will show you how you to integrate Ghost with KeystoneJS without the need for redirections to another domain or subdomain. By the end of this article, we should have a KeystoneJS sample app running on Heroku that uses Ghost as its blogging platform. Ghost also requires a relational database to be installed. I will use a mysql server, but you might want to use a PostgreSQL database if you deploy your app to Heroku and need to sync local and production databases. ~/sandbox$ ps -aux | grep "mysql*"
Your KeystoneJS project is ready to go! We answered 'no' when asked to include a Blog to our KeystoneJS app. As a consequence, the generator will not include a Blog link in the top navigation bar of our welcome page. It's been reported (see comments below) that npm install ghost --save can install a module that corresponds to this github project: https://github.com/ecto/ghost. This is the wrong module. Hopefully, npm will resolve this issue quickly. // customising the .env file in your project's root folder. Instead of letting Keystone create an express instance for us, we explicitly create one and pass it to Keystone as an option property3. The contentPath property specifies the location of the content folder used by Ghost for apps, data, images and themes. You can specify an alternative location by changing its value. Warning: Ghost no longer starts automatically when using it as an npm module. If you're seeing this message, you may need to update your custom code. Please see the docs at http://tinyurl.com/npm-upgrade for more information. The warning printed by Ghost is displayed automatically after 5 seconds unless Ghost starts the web server for us (using the ghostServer.start function). In our context, however, we do not want Ghost to start the web server5. The warning can be safely ignored. SUCCESS!!! 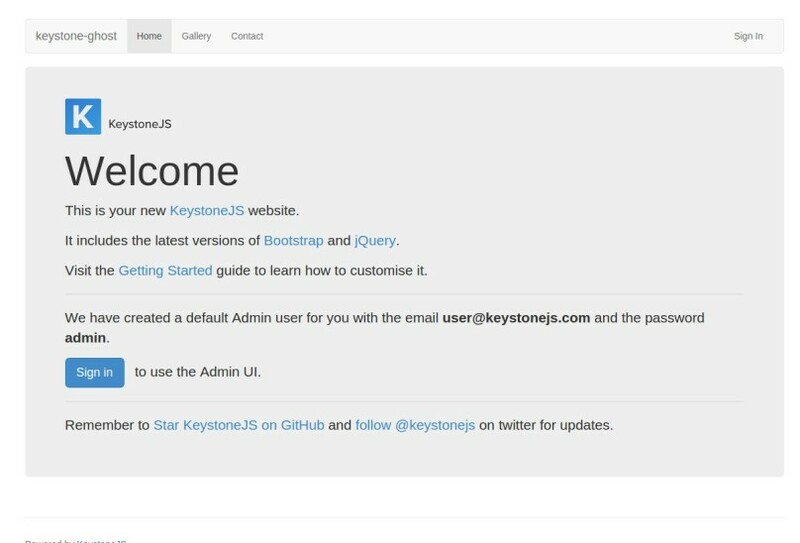 You are now running Ghost as a sub-app to your KeystoneJS app. ~/sandbox/keystone-ghost$ git commit -am "init commit"
Once these steps are performed, we can add the PostgresSQL add-on to our Heroku app. "dbname=dc63fs7hi45svb host=ec2-54-197-249-212.compute-1.amazonaws.com port=5432 user=lfeuordvsgaftr password=0ZS6YxRG9edAvx38mjlY9Qywaw sslmode=require"
~/sandbox/keystone-ghost$ git commit -am "fix node version and ghost production settings"
Compressing objects: 100% (175/175), done. Writing objects: 100% (187/187), 392.51 KiB | 0 bytes/s, done. After Heroku is finished deploying your app, open your browser to keystone-ghost.herokuapp.com and you should see a welcome page with a link to your Ghost blog! Voila! 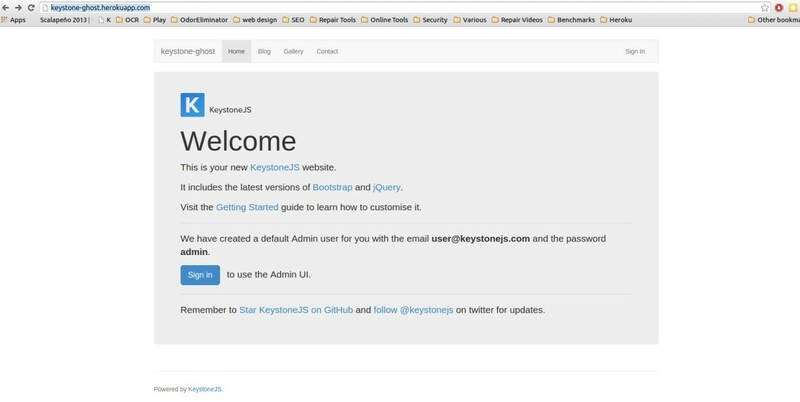 You now have a KeystoneJS app that runs Ghost for its blogging platform.